What a difference a decade makes. Prior to the 2001 season, the New England Patriots were best known for one monumental Super Bowl loss, one player being paralyzed in a preseason game, and two weird helmet logos. Flash forward to 2012, and the Pats are playing in their seventh Super Bowl, with a shot at their fourth title (only four other teams have that many or more). Greatness? They're tilting at that, too. Their coach and quarterback are making legit arguments for being called the best of all time. A collection of the Patriots' greatest hits is bound to have a lot of bangers from the past decade, which will happen when you have one of a literal handful of best decades ever in the NFL. So we've got Brady, Brown, Bruschi, Vinatieri, Vrabel, and Vinatieri again and again (and again)—it was a fun decade. But there's Grogan, James, and Bledsoe, too. Now, a "reward" for reading this far: Whaddaya call a Satan at the urinal? 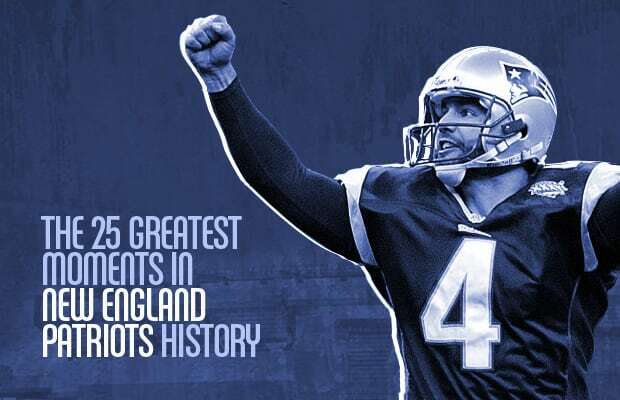 * Read on, for the 25 Greatest Moments in New England Patriots History.